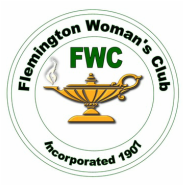 The FWC holds monthly meetings on the second Wednesday of each month at its clubhouse, 43 Park Avenue, Flemington, New Jersey. The day division meets at 12 noon. Meetings begin with a business portion and are followed by an interesting guest speaker. After the speaker, club members can socialize during our traditional Silver Tea with refreshments. In addition to the monthly general meetings, FWC members can choose to participate in activities ranging from community service, art, literature (Book Club), education, public affairs, conservation, gardening, and legislation. Social activities, such as the trip to the Hunterdon Hills Playhouse and the Luncheon and Game Party, and Lunch Bunch add to the experience. Click HERE to view the yearly calendar of events. Two fundraising projects are held each year. In October, FWC holds a Fall Luncheon with Entertainment. Funds from the ticket sales, raffle, 50/50, and Basket Auction are used to make donations to local charities. In April, a Luncheon and Game Party at the clubhouse provides funds for a $2,500 scholarship that is awarded to a Hunterdon County Central High School senior. College District, NJSFWC of GFWC.